Malwarebytes, the popular antivirus software makers has joined the ranks of AVG, Avast, and Vipre by bringing their anti-malware mobile app to the Play Store. Android’s success and widespread usage has meant that cybercriminals are extending their business to mobile devices as well. The mobile arena is an open playground for hackers and it is becoming more and more essential for us to protect and safeguard our data and privacy with an antivirus anti-malware solution. The team from Malwarebytes have written their codes from scratch and only included the features it considered essential for protection. So you won’t find a very comprehensive, complicated or redundant set of options that a default Android device already offers. Instead, you’ll find all the necessary features required to weed out the rogue apps that may affect your device. The app is powered by an advanced custom-built detection engine that keeps track of over 200 malware units and their variants. Not only will you get real-time protection, the app will also scan third part apps for Trojans, backdoors, spyware and such, identify the security vulnerabilities and eliminate them. 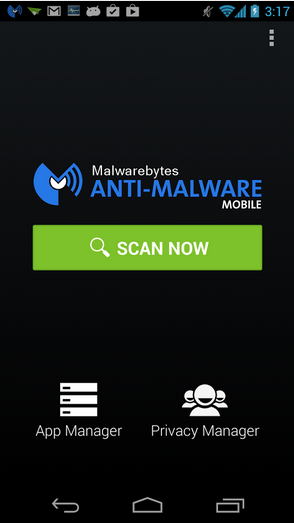 When you download and install Malwarebytes Anti-Malware App, you are greeted with a simple home page that displays a big green Scan Now button; an App Manager icon and a Privacy manager icon. 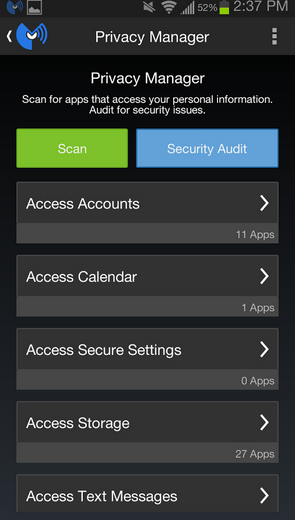 The Scan Now button proactively scans apps and files for malware and spyware; it scans native memory and the SD card. 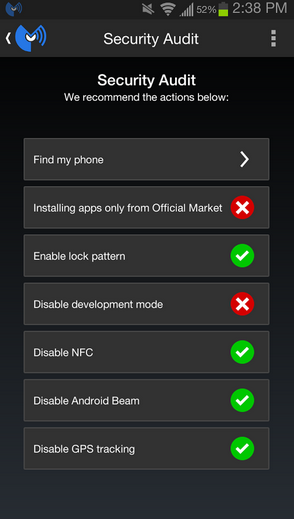 The app also automatically schedules scans and updates the database automatically. The Privacy Manager identifies the access privileges that each app holds and categorizes them into sections such as contacts, identity info, SMS and so on, so you get an idea which applications are accessing what type of your personal information. This will help you track apps that are using your data or employing premium services without your knowledge. A security audit flags vulnerabilities on your device and suggests remedial actions. It also links to your Android Device Manager so that if you happen to lose your device, you will be able to locate, lock, or reset it. The application manager identifies apps that are installed, running and whitelisted and displays the results in a tabbed format. This makes it easier for you to turn off apps that are not required so that you can conserve your system resources. Malwarebytes Anti-Malware runs in the background and will run a scan once a day at noon time, but you can change the scan interval to one that is more suitable for you. You will find all your can logs in the Scanning History section. 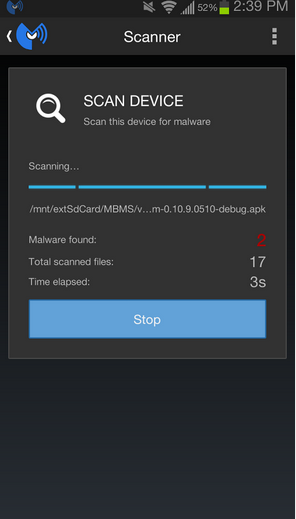 If the desktop version of Malwarebytes is anything to go by, the Android app should certainly be just as good. It’s quite hard to settle for an app that looks so bare boned, especially after having navigated through some pretty heavy ones, but for the moment, I’m going to stick with the app and reserve my judgment on this one. Malwarebytes Anti-Malware is free and can be downloaded from the link below.